The Pokemon website published a new article on Pokemon: Detective Pikachu today. We get some additional insight into the film, thanks to some commentary shared directly by the team. There’s talk about why the 3DS game’s plot was featured instead one of the franchise’s other stories, what it was like recreating Pokemon for the big screen, and more. The announcement of a live-action Pokémon movie came as a great surprise to fans, and perhaps even more surprising was the choice to base the movie on the Detective Pikachu video game instead of one of the franchise’s other stories. Ali Mendes, one of the producers of POKÉMON Detective Pikachu, helped us understand why this tale provides such a great entry point. Not only does it feature a heartwarming story – the movie is also about all the things that make Pokémon great. “We felt like this was a way to celebrate everything inside of Pokémon’s legacy – 20 years of battling and these characters that people have fallen in love with – but to also do something a little bit unexpected, a little bit new, and kind of add a genre twist to it,” she said. 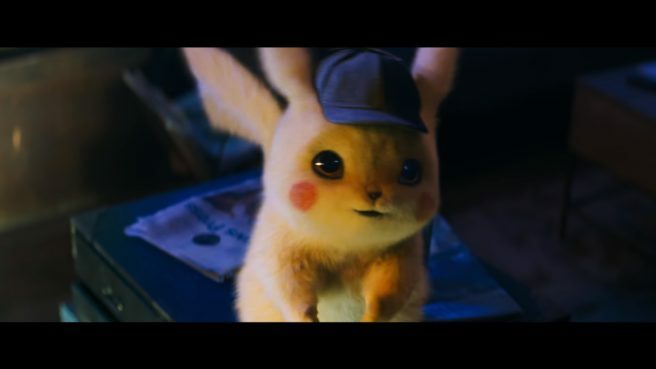 It was Detective Pikachu and its unique story that led Legendary Pictures and The Pokémon Company to agree this was the time to try out a live-action film. The son of this father-son story is Tim Goodman, played by Justice Smith. Tim, who works as an insurance agent in another town, heads to Ryme City to take care of affairs following the disappearance of his estranged father, Harry—and it’s there he meets a one-of-a-kind Pikachu. Tim quickly realizes that he – and only he – can hear the film’s eponymous Detective Pikachu (voiced by Ryan Reynolds) speaking human words. Tim soon receives even more shocking news: Pikachu reveals that he was Harry Goodman’s partner, and that if he’s alive, Harry must be, too. Tim agrees to team up with Pikachu in an attempt to find and reconcile with his father. The two make an unlikely pair. Tim is cynical and aloof thanks to some rough experiences from his childhood—namely, the loss of his mother and the departure of his father—while the energetic Pikachu is boisterous and talkative. Tim initially finds himself frustrated with his new partner, and the evolution of their relationship is a key element of the film. Early on during their search for clues about Harry’s disappearance, the two encounter Lucy Stevens (played by Kathryn Newton), an aspiring reporter working as an intern at Ryme City’s biggest news network. Lucy’s own investigation leads her to believe something is off about the disappearance of Tim’s father, and she joins Tim and Pikachu’s search, in part to further her own career. Lucy is passionate, ambitious, and a bit of a goofball—all traits that paint her as a foil to the more reserved Tim. She brings with her a partner Pokémon of her own, the lovable but perpetually confused Psyduck, and the pair round out the film’s cast of protagonists. Pokémon fans are sure to enjoy seeing familiar Pokémon reimagined in full 3-D on the big screen. Ali Mendes spoke to us at length about the creative process of adapting such beloved companions: “What does a live, realistic, 3-D Pokémon look like? That was a really exciting challenge for us,” she said. Visual effects artists rendered more than 60 different Pokémon into this unique style. And from what we were able to see, the 3-D Pokémon designs are a big jump forward in texture and realism—the furry Pikachu and feathery Psyduck maintain their usual charm while seeming more like creatures you might find outside your own window. The film’s depiction of Charizard left an especially big impression on us. Textured skin, sharp teeth, and an incredible wingspan come together to create a more menacing likeness than we’ve ever seen – and this particular Charizard has fierce intensity in its eyes. But despite its intimidating, realistic appearance, it’s still distinctly Charizard. Charizard may look like a dragon, but it’s not your standard storybook dragon – it’s a dragon-like Pokémon, “and that is a specific look,” Mendes explained. Creating a realistic-looking Charizard involved balancing the endearing aspects of the Pokémon with its more powerful, ferocious side. “It’s been a real challenge, and I think our visual effects team has really risen to that, and people are going to be very excited about what they see,” she said. Perhaps no one we talked to was more excited about the reimagined Pokémon than Justice Smith, whose eyes lit up as he remembered the first time he saw the Pokémon brought to life. Much of POKÉMON Detective Pikachu takes place in the bustling Ryme City. Like the film’s more realistic take on the Pokémon themselves, Ryme City bears close resemblance to some of the biggest cities in our own real-life world. The city is a mash-up of the aesthetics of Tokyo with the backdrop of London, where much of the filming took place. Ryme City’s darker backdrops fit the film’s neo-noir theme, and as Production Designer Nigel Phelps explained, it was equally important for highlighting the colorful cast. The cutting-edge Ryme City incorporates Pokémon into its culture quite differently than most places in the Pokémon world. Instead of spending time inside Poké Balls, the Pokémon roam around freely, and traditional Pokémon battles are prohibited by law. Pokémon battles aren’t a major focus of POKÉMON Detective Pikachu, but fans hoping to see photo-realistic Pokémon engage in lifelike battle are in for a treat. In fact, an elaborate one-on-one Pokémon battle was being shot when we visited the set. In Tim’s hometown, just like in other parts of the Pokémon world, there are official battles with rules and regulations, and the Pokémon choose to team up with humans for battling and training. In Ryme City, things are very different. Pokémon battles are prohibited…but that doesn’t stop people from holding them in a surreptitious underground arena. When Tim and Pikachu find themselves in the arena, Pikachu decides to jump into battle—but the structure of the match won’t be quite what fans are used to. Pikachu’s opponent is Charizard, resulting in a showdown between two of Pokémon’s most iconic characters. Charizard’s burning tail and explosive attacks are sure to create quite a dazzling display, and its Trainer is equally extravagant and eccentric. The outrageous DJ is clad in an oversize hoodie with furry trim, wears huge rings and glasses, and leaves his shirt open, revealing a massive Charizard tattoo on his chest. This approach of adding references and taking inspiration from other Pokémon projects – without mimicking them directly—is a major part of the aesthetics of POKÉMON Detective Pikachu. Costume Designer Suzie Harman extensively researched the Pokémon animation when designing costumes for the film, getting a sense of key looks to inspire her work, as well as an idea of how the characters wear their clothes and the types of silhouettes they project. She took special care to keep the costumes subtle enough to appear realistic. The imaginative sets in POKÉMON Detective Pikachu are full of clever ways to highlight different Pokémon and objects. Longtime fans will be particularly excited by one set Newton described. The set shows off Evolution stones and is kind of like an exhibit of the history of Pokémon, she said. While we were on the set of POKÉMON Detective Pikachu, it was fun to learn just how many of the cast and crew members are fans of Pokémon. For example, Justice Smith has a soft spot for the Big Jaw Pokémon – perfect for someone who has so many lines in the film. His costar Kathryn Newton was similarly inspired by her early memories of Pokémon. Listening to Newton makes it easy to imagine POKÉMON Detective Pikachu inspiring a lot of fans, too.